Don’t leave harvesting until the leaves die back completely as with onions, because by this time the bulbs will have started to split. Once the bulbs have split, they are still fine to eat, but won’t store for long. So eat these ones first. Some cultivars with curled flower stems, are ready to harvest as the coil in the stem begins to straighten. Most hardneck cultivars though, should have their flower stems removed before this time, because growing a flower stem reduces the nutrients going to the bulb so that bulbs are smaller. But there is also some evidence to show that leaving the flower stem attached until after curing will lengthen storage times. So you may need to choose between bulb size and length of storage! 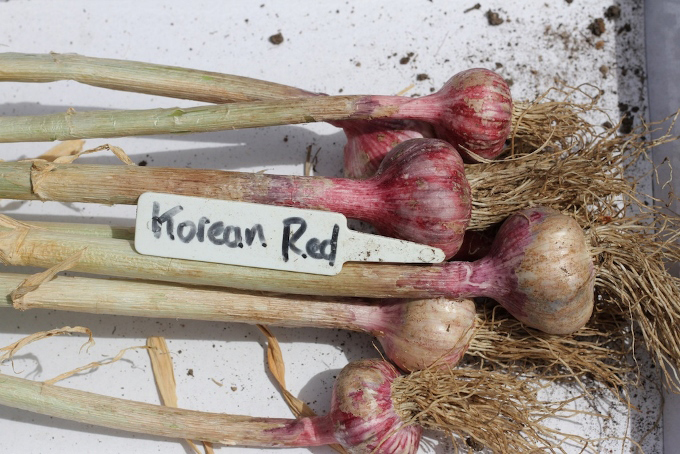 Garlic that has been planted in light soils can just be pulled out of the ground. If your soil is heavier and/or you have planted them more deeply, then the best way to get the bulbs out is to insert a fork under them and carefully lift the whole plant. Shake or brush off any excess dirt. Don’t bang them against each other or anything else as this will bruise them and shorten storage life. Some books and articles suggest drying the bulbs in the sun for a few days before curing. This may be OK in cool countries and climates, but in Australia our summers get too hot and the bulbs are likely to get sunburnt. The protective skins don’t fully develop until after curing. In dry areas, some growers place freshly dug bulbs in groups on top of the soil, to dry out and start the curing process. 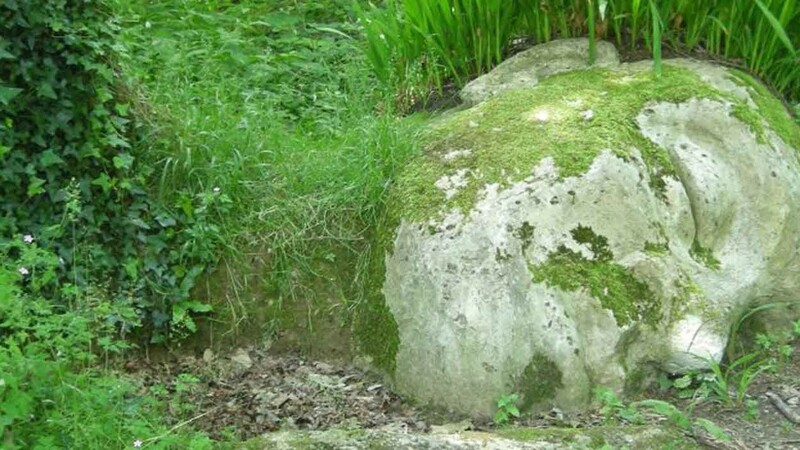 They are arranged so that the green leaves from one clump of bulbs, protect the next clump from the sun. 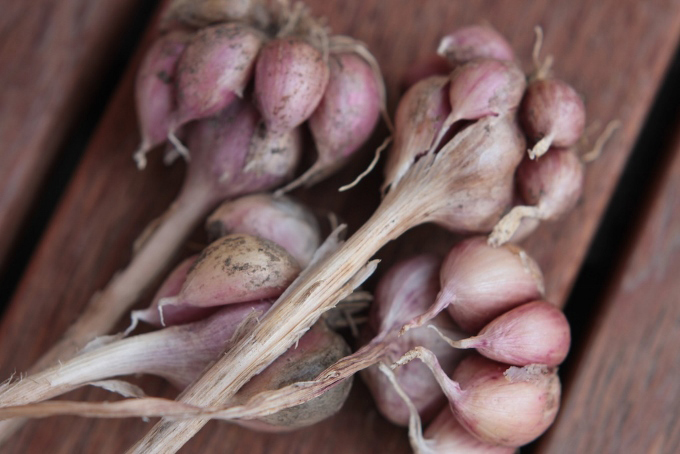 However, even then some garlic bulbs can get sunburnt, and the dramatic rise and fall in temperature from day to night can harm the bulb, reducing storage times. If an appropriate space is available they are better cured under cover, where temperatures fluctuate less. Leave plants intact (don’t remove leaves, flower stalks or roots) and hang in bunches or place on racks in a dry airy position that doesn’t get too hot. An old window screen, resting on sawhorses or something similar, makes a good drying tray. Or hang them from the eaves, as long as they are out of the sun. Leave them for a minimum of two to three weeks but if you can leave them for two months then they are likely to store for longer. In more humid areas it is a good idea to cut the roots really short or remove them altogether as they can act as a wick absorbing moisture and carrying it to the bulb thus increasing the chance of fungal diseases. Also, keep an eye on the leaves and if they show any sign of going mouldy, cut them off immediately because this mould will spread to the bulb. 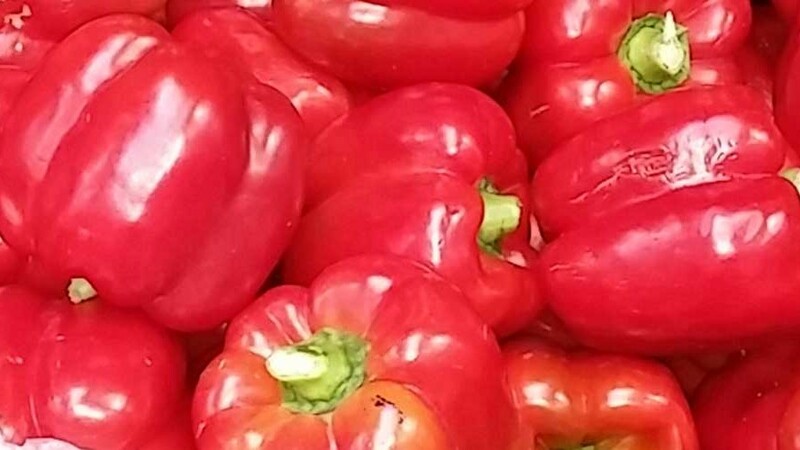 Curing is particularly important if the bulbs are not quite mature, as the bulb continues to absorb moisture and nutrients from the stem and leaves after harvest. If you haven’t already removed the flower stem, then harvest and dry hardneck garlics with the flower head and stem still attached. 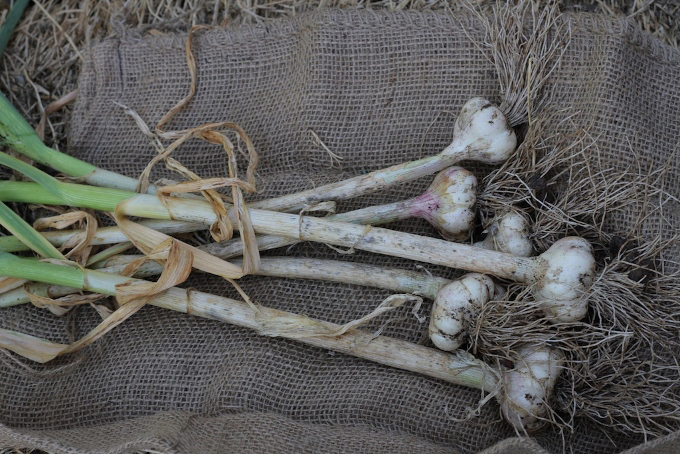 Bulbs with the leaves attached can also be plaited into strings and hung in a dry airy position. See www.pennywoodward.com.au/articles for photographs that show you how to do this. Once the bulbs are cured the skins will be papery and dry and the bulbs should feel firm and tightly packed. Check for any diseased, damaged or bruised bulbs and remove them. If the damage is only minor then just eat them. This is also a good time to select the bulbs you want to use for replanting. Choose the best and the healthiest, set them aside and store them separately from the bulbs to be consumed. This way they won’t get eaten by mistake. To allow for replanting,10 to 15 percent of the crop needs to be retained. The optimum storage temperature for bulbs for replanting is 10°C, with limits of 5°C and 18°C. Unless the bulbs are to be plaited or hung in bunches, all the leaves and stems are now cut off about 2 cm from the bulb. Leave only 1 cm of the roots. Don’t try to wash off dirt or separate the individual cloves as either of these actions will radically shorten the storage life. Store bulbs in shallow cardboard boxes, in slatted wooden boxes, on trays, in net slings, in stockings, or in plaits – in fact in any way that allows air circulation around each bulb. The room where they are stored must be dry, airy and not too cold or hot. Check bulbs every few weeks and remove any diseased ones. Properly stored, some cultivars will last for twelve months or longer. 2 Garlic left in the ground too long so that the bulbs have split. 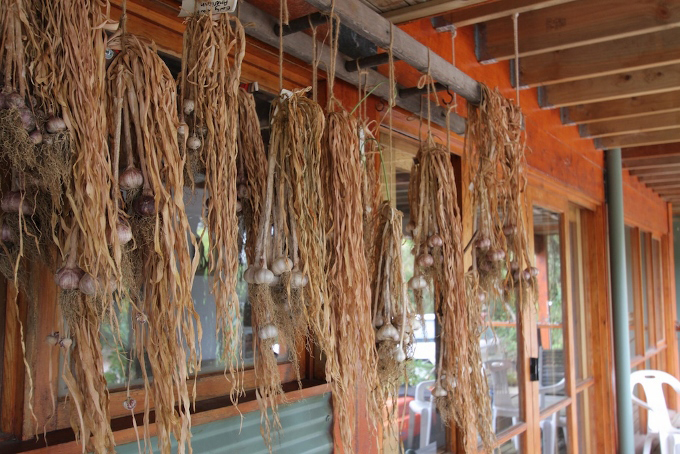 4 Garlic hanging to cure in a dry, airy position out of direct sunlight. 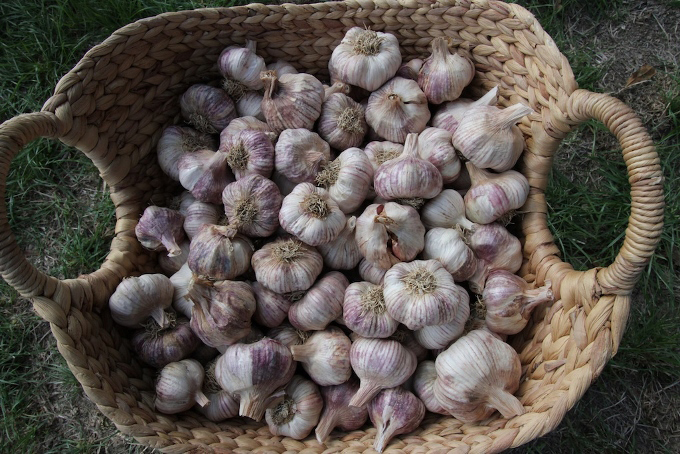 5 A garlic crop after curing, and trimming to remove roots and leaves.